Points of Youth displays work from middle and high school youth who partnered with artists Andrew Cho, Cathy Joritz, and Brandon Keenan to produce wondrous visuals in Ceramics, Drawing, Painting, and Expanded Media. 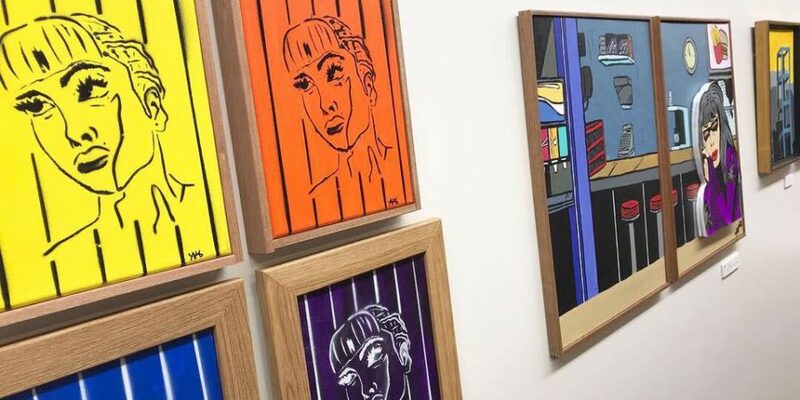 As part of a partnership between the Boys & Girls Club and the Lawrence Arts Center, the artists traveled between both organizations creating new and exciting work. These talented students unpacked perspectives, discussed the meaning of what it is to be young and driven, and then remixed it all into an entire show that celebrates the diversity of image and meaning. The artists did more than just make the work—they built this show from the ground up. They took on the marketing, hospitality, food and drinks, framing and display, and everything required to put together a professional show. Points of Youth is not only a celebration of visual art; it is an opportunity to meet, speak with, and support young artists. 100% of sales go directly to the artist, so come join us Final Friday, March 29th from 5-8pm at the Lawrence Arts Center, 940 New Hampshire St. There will be stunning artwork, delicious food and drink, and the hubbub of a Final Friday show put on by the artists.